Paterson Great Falls National Historical Park is an urban national park located in Paterson, N.J., in the northeast United States. 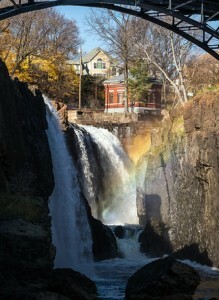 The park features the Great Falls of the Passaic River as it flows through Paterson, once a key industrial city in America’s late 18th century and 19th century development. The park was added to the National Park Service on Nov. 7, 2011. Formerly Great Falls State Park, the area and other land along the river were transferred to the federal government for the creation of the national historical park. Visitors to the park can take a ranger-guided tour to orient themselves to the site as well as learn about the city’s rich history and its part in America’s industrial age. The tours are organized out of the park’s Visitor Center. The walking tour is an opportunity to learn about the city of Paterson and its Great Falls is one of national historical importance. The tour teaches visitors about the natural and cultural diversity of Paterson and how it helped the economic and social growth of America. Viewing the waterfalls is the favorite activity of visitors to the park. This may be done from Overlook Park or from Mary Ellen Kramer Park. Visitors may also visit historic mills that produced cloth and other materials for generations. The Great Falls National Historic Landmark District allows visitors interested in the historic mills that were such a key part of Paterson. We hope you will enjoy reading our work, viewing photographs, and watching our slideshow about the park.